A saga of the early Christians' fight for the freedom to worship. 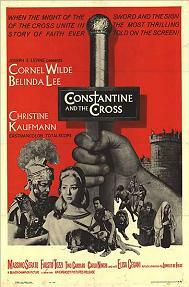 Constantine (Cornel Wilde) defeats the Roman armies and employs the Edict of Tolerance. Also stars Belinda Lee. This was to be British actress Belinda Lee's last screen appearance. On March 12, 1961, while heading towards San Bernardino, California and travelling 100 m.p.h., Belinda was involved in a fatal car accident. Sitting next to the driver, her body was thown 60 feet from the car. She did not die on the spot. She died twenty minutes later from a fractured skull and a broken neck in the arms of a California police officer who watched her moaning repeatedly. He was later quoted as saying "I will remember her as the most beautiful thing I've ever seen." The driver sustained only minor injuries.